I had another Teeny-Tiny Mochimochi urge but felt thoroughly uninspired by the colours of yarn in my basket so decided to do some dyeing. I gathered my Knit Picks yarn which I had separated into 15g mini skeins and my easter egg dyes and spent a couple of hours stinking out the kitchen with vinegar :) I really like the vibrant colours you get from easter egg dyes and also love the fact that they are non toxic which means I can use whatever pot I can grab to dye in, instead of having to have special dye pots. I don't really follow any formula when dyeing like this. I soak the yarn in water and a splash of vinegar for about 10 minutes (I'd probably leave it a bit longer if I was more patient), then I fill a jar or bowl 3/4 full with water and another splash of vinegar and dissolve the dye in there. When it's all dissolved I add the yarn making sure that it is totally covered by the liquid, cover the top with cling film and pop it in the microwave for about 3-4 mins, keeping an eye on it the whole time. When the water is clear the dyeing is done and I just leave it to cool for a bit. After a mini rinse I soak mine in some lavender Eucalan to make them smell nice and after squeezing out some of the liquid I hang them to dry. Do you dye? 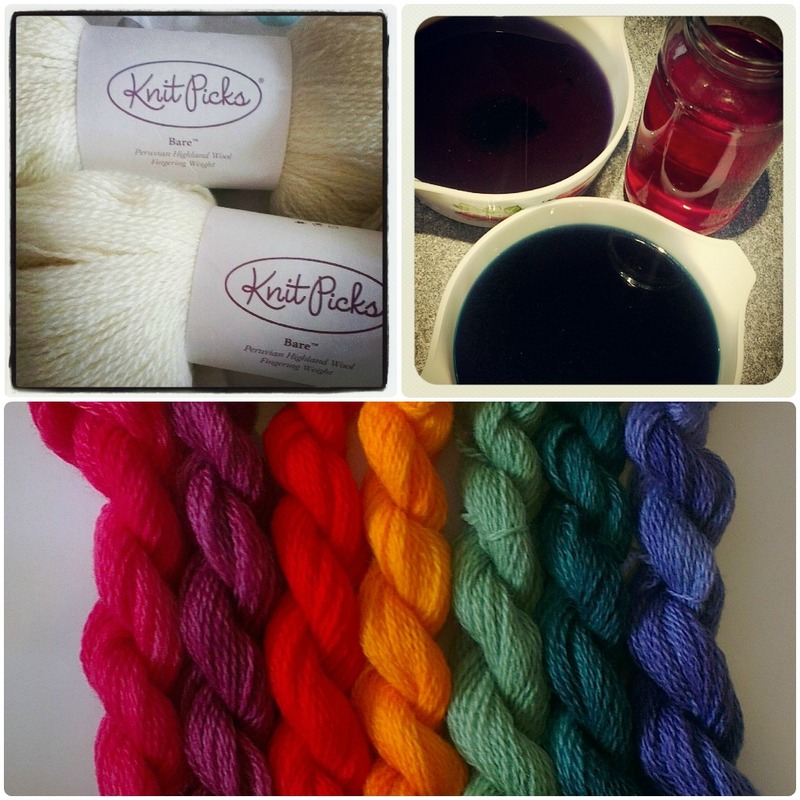 What are your favourite dyes and yarns to dye? Thanks Bubbles :) Easter egg dyes are perfect if you want bright colours - one of the reasons I love them! Seriously, you should try - great fun! Lovely colours. I had a go with easter egg dyes, but it was not in powder form and the colours were a bit wishy-washy. I've just been playing with beetroot!! Looking forward to seeing the little monsters! These were the tablet type ones. Beetroot eh ... hows that going as I have some in the fridge :) I would quite like to give some natural dyeing ago it's just the mordants and unpredictability that puts me off.